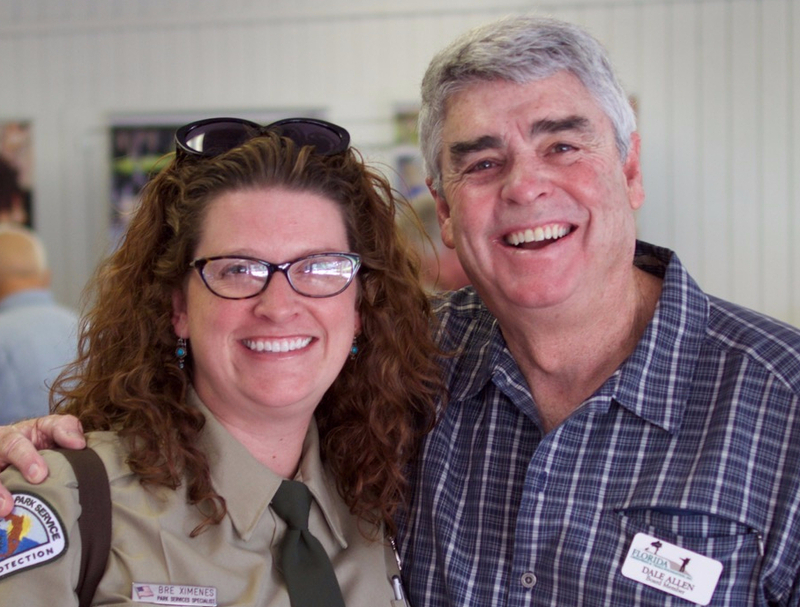 Dale Allen with Bre Ximenes of the Department of Environmental Protection at the June FGTF Board Meeting. Heart of Florida Loop to enlarge. 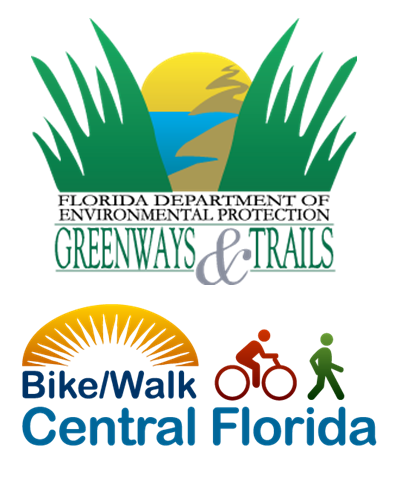 It’s no secret that the Florida Greenways & Trails Foundation has big dreams for the future of Florida trails. We envision a statewide connected system of greenways and off-road paths that offer a unique user experience and provide mobility options for trail lovers of all ages. 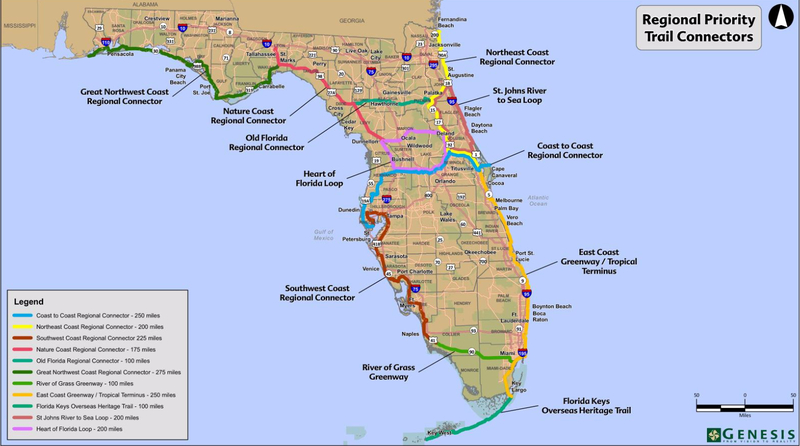 The Coast to Coast Connector trail, connecting the Gulf Coast with the Space Coast, is a 250-mile step in the right direction. As the C2C takes shape, another long distance, regional trail is emerging: the Heart of Florida Loop. This 215-mile trail circling through seven counties between Orlando and Ocala will sprout north from the C2C, creating an off-road, paved circle in the middle of the state. Once the C2C is complete, the Heart of Florida Loop will only need to fill 61 miles of gaps. Let’s say you are pedaling west on the South Lake Sumter Connector portion of the C2C, but instead of going to St. Petersburg, you want to experience the Heart of Florida. Turn your wheels north onto the Withlacoochee State Trail, head east on the Cross Florida Greenway, continue east through the Ocala National Forest and eventually south onto the Spring-to-Spring Trail, where you will meet up with the C2C again in Volusia County. You won’t want to miss the view. For starters, there’s the Black Bear Scenic Trail, Silver Springs State Park, and Marshall Swamp. Other highlights include campgrounds, natural wetlands and access to wildlife. It’s the heart of Florida like you’ve never seen. As we continue to champion regionally-connected trails like the C2C and Heart of Florida Loop, the dream of a statewide connected system is finally within our reach. Thank you for joining us on this ride, and we hope to see you on the trails! What does it take to create a world-class destination? Dedicated funding source to complete trail – check. Commitment to fill trail gaps – check. 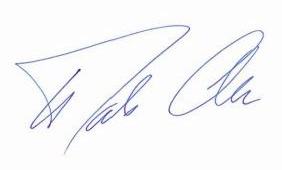 Enthusiastic support from local communities and elected officials – triple check. The C2C has the basic ingredients necessary to cook up a 250-mile trail that stretches from the Gulf of Mexico to the Atlantic Ocean, thanks to the Florida legislature, Florida Department of Transportation (FDOT), the Office of Greenways and Trails, and the Florida Greenways and Trails Foundation. But, nobody wants this to be just another trail. The C2C is destined to be world-class. That’s why a C2C Leadership Team was formed to share ideas and best practices on how to make this happen. 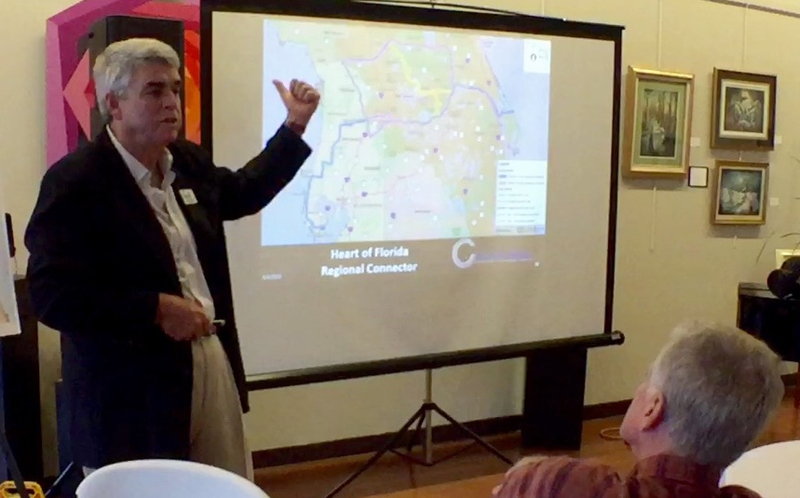 Their second meeting was in June and there the group viewed the results of the recent Florida trail manager survey and discussed additional funding opportunities needed for things like signage, public art, and enhanced trail amenities. Their goal: build a trail that attracts people from all over the world, and create an experience you will want to repeat over and over again. For more C2C, check out OGT’s second C2C Status Report which includes project updates by county and more information about the C2C Leadership Team. It sounds easy. 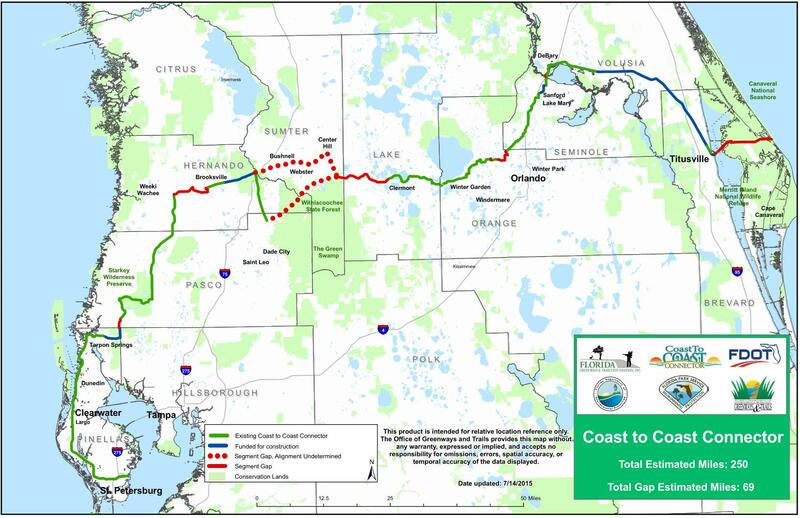 A mere half of a mile is all that is needed to connect the Coast to Coast trail between Seminole and Volusia Counties. However, what this gap lacks in distance it makes up for in complexity. We’re talking about navigating where a busy U.S. Route 17-92 intersects with Interstate 4, and constructing a bridge to allow trail users a safe crossing over the St. Johns River and Lake Monroe. Issues to consider include cost, safety, and trail width. The FDOT is looking at a variety of options for this trail section and have asked for the help of local governments and transportation officials. A joint subcommittee of the Bicycle & Pedestrian Advisory Committees (BPAC) from both MetroPlan Orlando and the River to Sea TPO is being formed to review options and make a recommendation. Mighk Wilson, a Smart Growth Planner with MetroPlan Orlando, expects a recommendation to be made at their October BPAC meeting. No matter what, you can expect it to be a few more years for construction to start. 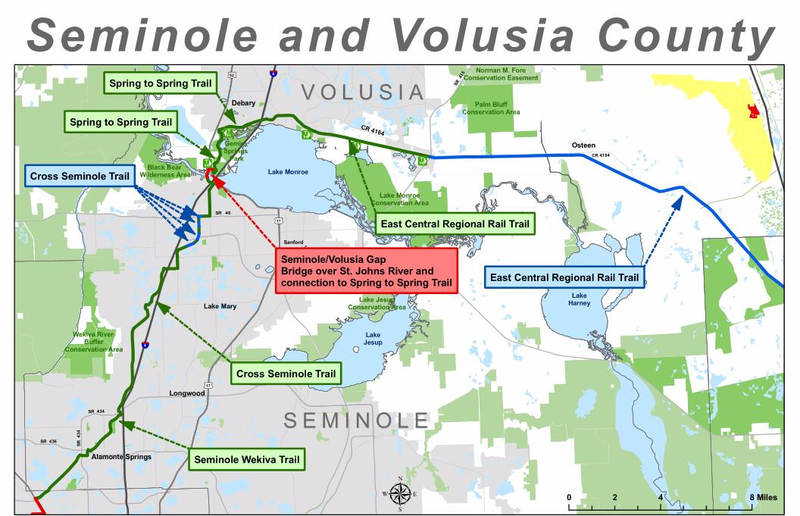 In the meantime, C2C fans can look forward to a very scenic ride that will connect the Cross Seminole Trail and Sanford Riverwalk Trail in Seminole County with the Spring-to-Spring Trail in Volusia County, winding around Lake Monroe Wayside Park. And, a birds-eye view of the St. Johns River and Lake Monroe for that essential half of a mile. 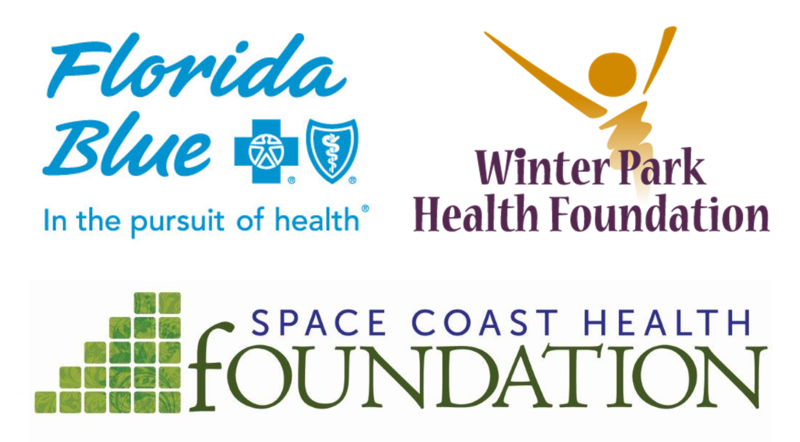 Three cheers for Senate President Andy Gardiner, Governor Rick Scott and the Florida legislature, who once again, made trails a priority during the 2015 legislative session – to the tune of $25 million. The Florida SunTrail Network will receive $25 million a year from the Florida Department of Transportation, thanks to Senate Bill 2514-A. Haven’t heard of it? Let us catch you up. SunTrail, which stands for “Shared-Use Nonmotorized,” aims to create a statewide network of biking and walking trails or shared-used paths physically separated from roadways across Florida (think the C2C, but from Key West to Pensacola). This would mean riding your bike from Tallahassee to Miami and never seeing a car. We can expect the SunTrail Network to boost economic development around the state, provide safe recreational opportunities for residents and visitors, and preserve Florida’s natural scenery for generations to come. That’s $25 million well spent. In a major win for the development of Florida’s bicycle infrastructure, Governor Rick Scott has signed legislation that will significantly increase spending on bicycle and pedestrian trails. House Bill 2514-A requires the Department of Transportation to allocate $25 million per year to the Florida Shared-Use Nonmotorized Trail Network, or SunTrail. The SunTrail, an initiative backed by Senate President Andy Gardiner, will be a statewide network of biking and walking trails that are physically separated from roadways. The SunTrail has been an important priority for Senate President Andy Gardiner, who has been a major supporter of trail projects in recent years. In 2014, $15 million was allocated to the Coast to Coast Connector trail, another initiative backed by Senator Gardiner. Tiny flags marked the location of a bicycle/pedestrian bridge that will go over Garden Street, which will likely be the most prominent part of the Coast to Coast Connector trail throughout North Brevard. Work on the trail bridge on site is expected to begin in the next few months. Brevard County Commissioner Robin Fisher said he wants to make sure that there is enough signage on the bridge and trail. He said people will take photos of themselves with the signs and post on social media, which in turn will encourage others to also visit Titusville. “It’s important for the whole trail,” he said. The Florida Legislature approved in the state budget $25 million for trails, which could help to get the Coast to Coast Connector trail completed within five years. One of the first steps in completing an ambitious 275-mile cycling trail from St. Petersburg to Titusville is a project that will link more than 100 miles of bike paths stretching from Pinellas County to Hernando County. 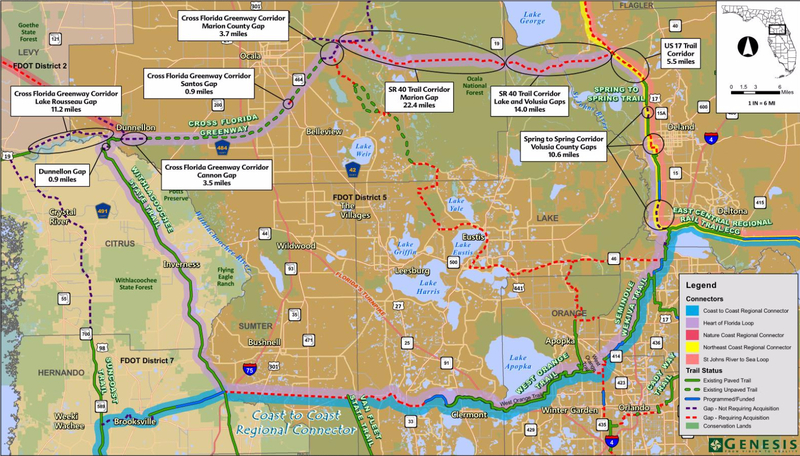 A 7-mile gap between the Fred Marquis Pinellas Trail and the Starkey Boulevard Trail in southern Pasco County is the first of about a half-dozen projects planned by state officials to finish the statewide Coast-to-Coast Connector Trail. When the link is finished, Tampa Bay area cyclists will have access to the longest continuous trail in Florida. Know your C2C facts including the name, length and location of each gap, the major players around the state making it happen, and challenges faced in creating the trail. Once you are up to speed, share on social media and quiz your friends!